The biology of the mines forms a fascinating subject in its own right. While the surface flora and fauna have been studied as part of the Alderley Edge landscape Project, relatively little has been done over the years regarding the underground biology. The article produced below was written by Brian Beck and Dr George Taylor (now both deceased) in 1976 and relate to West Mine but some aspects, such as the white crustal deposits, doubtlessly apply elsewhere. Along with the article, is a list of the species extracted from Beck and Taylor's article and a short note on Fungi in general. There are a number of good sources on the Internet, not least on Wikipedia which covers many of the species named. The illustrations below are from Wikipedia. Troglobites: which always live underground. Alderley examples are the fungi in West mine. Troglophiles: which like living underground but not all the time. Examples are bats and cavers. Trogloxenes: for which caves and mines are not normally home. Examples might be rabbits or badgers that use caves as a replacement for their normal homes. For more information on underground flora and fauna, a good starting point is the "Encyclopedia of Cave and Karst Science", 2004, editor: John Gunn; look under Organisms: Classification. Incidentally, troglodytes are not defined in the technical list although this is the common term for cave-dwellers, including humans and animals. 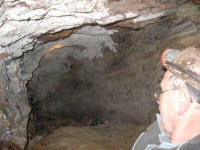 The identification at Alderley Edge was carried out in 2008 by licensed persons from the National Trust and Environment Agency who also gave permission for the photograph below (left) to be taken in one of the mines during their visit. 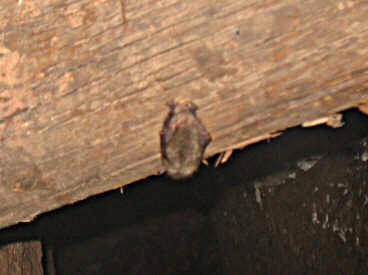 The Daubenton's and Common Long-Eared bats have both been sighted at Alderley Edge. There is plenty of available information on bats underground published by the BCRA, BCA and other non-caving bodies. Do not disturb them by touching, shining lights, photography or simply staying near them for too long. On no account should they be handled. This is a criminal offence. Inform the mine manager or deputy but do not generally discuss the find unless the bat is in a place where disturbance is highly likely and other members need to be aware to leave it alone. Verticillium. Found in more than one form which are associated with coloured patches on the walls. 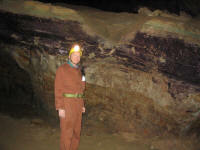 V. chlamydosporium is found in the lighter patches on the purple band in Sphinx Chamber. Flowering plants and ferns cannot grow in the lightless conditions of the mine, but when West Mine was re-opened in 1975 various fungal growths were observed in the mine workings. Some of these were growing on obvious plant remains such as old mine timbers, but others appeared to be associated with areas of mineralisation in the rock walls and the source of nutrition of these specimens was less obvious. Mycological examination of material collected from the West Mine commenced in May 1976. Laboratory culture and examination of the specimens has been made possible by the courtesy of Professor J. Colhoun of the Botany Department, The University of Manchester. Hypholoma fasiculare (Hudson ex Fries) Kummer, the common 'Sulphur Tuft' fungus, occurs producing mushroom type fruiting bodies on an old timber near the mine entrance. The walls at the entrance are covered with a white crustose growth. Electron micrographs show this to consist of very fine filaments similar to those produced by Streptomyces, a genus of soil inhabiting bacteria with a mycelial rather than unicellular growth form. Efforts to obtain this organism in pure culture have so far been unsuccessful, although two hyphomycete fungi Acremonium pteridii W. Gams & Frankland and Oidodendron tenuissimum (Peck) Hughes have been isolated from this area. A remarkable growth of fungal rhizomorphs has been discovered on an old timber in an isolated chamber. The identification of this fungus remains to be confirmed, but it is probably a species of Armillaria the well known ?bootlace fungus?. The microscopic fungi Trichoderma polysporum (Link ex Pers.) Rifai Aggr. and Mortierella hyalina (harz) W. Gams were found in association with the Armillaria. A striking association of filamentous fungi have been found growing together on a moist sand floor near the ?Green River?. This association appears as dark purple patches on the sand. Four species of hyphomycete fungi have so far been isolated from this material. The colouration of the sand is probably caused by the purple hyphae and brown bulbils of Papulospora rubida. It is to be noted that this rather uncommon genus has previously been recorded in caves in the Bahamas. The only animal life so far found in the mine occurs in this sand, the microscopic free-living eelworm Acrobeloides. A distinctive band of purple colouration occurs around the wall of the Sphinx chamber. Studies with the conventional light microscope and high resolution observations with the scanning electron microscope have confirmed that purple filaments of two fungal species are, in part, responsible for the colour; Chrysosporium pannorum (Link) Hughes inhabits the darker areas of the band and Verticillium chlamydosporium (Goddard) occurs on the lighter areas. These fungi grow in association with two as yet unidentified bacteria. One of these, which appears purple in laboratory culture, is able to manufacture protein from inorganic salts in dark chambers in the laboratory. and a rather odd hyphomycete which has not yet been identified. The West Mine at Alderley Edge provides a unique biological environment. Fungi and most bacteria require organic matter on which to grow, and there is very little available in West Mine. No new organic matter can have been introduced during the fifteen or more years the mine was sealed, and yet the fungi recorded above have been able to grow and develop. Also, it is not easy to understand how Chrysosporium and other hyphomycetes can grow on bare rock walls which may contain copper in concentrations normally lethal to fungi. It may be that the bacterium found in the purple band will provide a key. Chemo-autotrophic bacteria, with the ability to build organic matter from inorganic materials in the dark, have been described by Caumarin from deep caves in France, and it may be that they form the beginning of a food chain in West Mine. Most of the botanical studies of English cave flora have been conducted in limestone caves where the plants and fungi grow under alkaline conditions. Preliminary studies indicate that the fungi in the West Mine are growing on neutral or acidic substrates, markedly different from those previously recorded in the literature. It is essential that this unique environment is properly preserved and made available for study by mycologists and bacteriologists. Such studies will significantly add to the information available on the biology of other, different types of caves and may well, in this unusual environment, lead to the discovery of very rare micro-organisms or micro-organisms completely new to science. B.D.A. Beck, M.B.E., B.Sc., D.Ag.Sci., D.Trop Ag., Alderley Edge, Cheshire. G.S. Taylor, B.Sc., Ph.D., formerly Senior Lecturer in Botany, The University of Manchester. Several diverse microorganisms are classified within the broad group of protists  called the fungi. 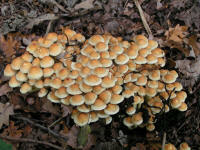 However, they do share some typical features that distinguish them as fungi different from other microbes. These distinguishing features are based on the physiology and morphology of cells. The fungal cell is distinguished from the bacterial cell by its size (generally greater than 1-2 μm in diameter) and its eukaryotic structure similar to that of plant and animal cells (cells having distinct membrane-bound organelles such as nuclei, mitochondria). Bacterial cells which lack these organelles are termed prokaryotic. Fungal cells divide by mitosis (asexual reproduction) and by meiosis (sexual reproduction); bacterial cells divide by binary fission. Like animals, the fungi are heterotrophic organisms that cannot manufacture their own food by photosynthesis as plants and algae can. They require oxygen for growth (aerobic) and generally prefer an acidic environment (below pH of 7) unlike the bacteria which are anaerobic and aerobic and generally grow in basic environments (at or above pH of 7). Fungi utilize preformed organic material from other organisms as sources of energy and building blocks for their cellular synthesis. Soluble nutrients are absorbed from the growth substrate following the breakdown of complex polymers by extracellular enzymes (proteinases, cellulases, pectinases etc.) secreted by fungal cells. The fungi have diverse morphologies especially in spore production which is the basis for identification. But, they are commonly recognized as the yeasts (single-celled thallus), the molds (filamentous thallus called a mycelium consisting of tubular cells in long, branched, thread-like structures called hyphae) and the mushrooms (macroscopic fungi with considerable differentiation of tissues and hyphae in the mushroom, the sporulating portion of the thallus, which is fed by a massive underground mycelium). The fungi, like bacteria, are very susceptible to drying and, therefore, are generally found in very most, if not aquatic habitats. They can resist desiccation by producing thick, melanized walls which are often seen in aerial spores, in hyphal strands, and in sclerotia that enable the fungus to survive suboptimal growing conditions in the soil for several years. The fungal wall usually consists of layers of chitin, a linear polysaccharide polymer of N-acetylglucosamine, embedded in and often covered by glucans, branched polymers of glucose and other sugars. Some species of fungi in the Class Oomycetes such as Phytophthora and Pythium have cellulose walls rather than chitin. The melanin components consist of branched polymers of phenolic material similar to the lignins of plant cell walls. Obtained from: 'Frequently Asked Questions About Fungi and Mycorrhizae' Contact: Dr. James Traquair on http://res.agr.ca/lond/pmrc/faq/menu.html accessed on 11 June, 2007. Protists (Greek protiston -a meaning the (most) first of all ones) are a diverse group of organisms, comprising those eukaryotes that can not be classified in any of the other kingdoms as fungi, animals, or plants. No, not you - cavers, real ones, only they have stopped crawling. Confused? Then read on. The author studies fungi and specifically fungi which parasitize insects, spiders and the like. There have been one or two investigations of these things, but nothing serious in the UK since WW2. Pretty well all animals can have fungal parasites and arthropods are no exception. Many of the fungi are incredibly specific so much so that they will infect only a particular species or family of, for example, flies. Some can only infect the host at a particular stage in the life cycle, say, mid-larval age. Indeed there is an extremely odd group of very tiny fungi called the Laboulbeinales which are so specific that they will only occur on a particular leg on ONE side of the host! A study in the Czech Republic fired my interest in the possibility of finding my 'prey' below ground. That study looked a number of underground sites including caves mines and cellars. What they were searching for was fungi parasitizing hibernating insects. A variety of fungi was found on a variety of insects. Unfortunately there are several very common types which are fully prepared to spoil the day of just about any insect that the can come into contact with. Also in that study they discovered that many of their finds were of unidentifiable fungal mycelium because it was sterile not having developed identifiable features. Of course there are many studies worldwide about cave life, from insects to bats and so on but fungi, ever Cinderellas, have been left out. My particular group is a Cinderella amongst Cinderellas. The author accompanied a work party in Engine Vein one Tuesday night in 2012. As expected the area which would be of interest to him was near the entrance of the mine. Alderley visitors will have seen the little white 'mould' covered mosquitoes which are commonly found there. They have yet to have the fungi identified, and indeed that might prove to be impossible, but there will be finds which are; specifically, moths, beetles and other kinds of fly. The author found one interesting spider, and one of what he believes to be a moth - there was little left of it, but the little yellow-ochre clubbed stalk growing from it was identifiable as a Cordyceps: the only fungi that the author knows to parasitize moths. If that is the case, it is this will be the 22nd British record and the first from underground. There is a chance that it could be something so similar that it is only identifiable microscopically. If it is that species it will be the first record of that fungus outside of Croatian caves with the possible exception of the Czech Republic! For anyone interested further, if you Google 'Zombie Ants', there is a clip from a documentary which you WILL find of interest, these are part of the same bunch! This article will be expanded as more information becomes available.